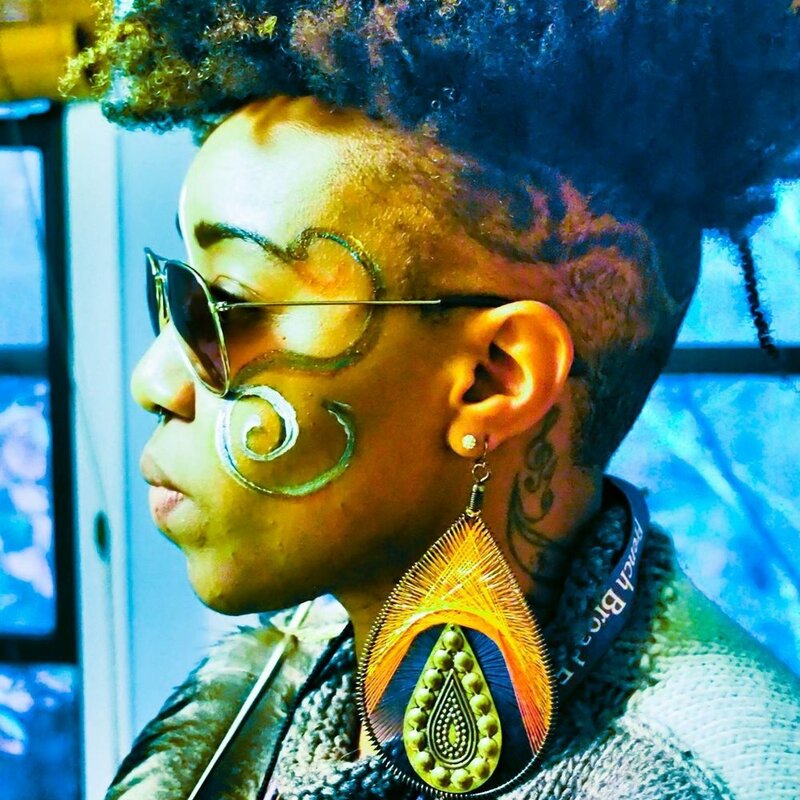 Cortina Jenelle Caldwell, Founder & Creative Director for Artists Designing Evolution, is a queer, Two-Spirit descending from generations of Southern, West African, Latinx & Native American peoples. Cortina is an artist, activist, community organizer, creative facilitator, social designer, and communication architect. Above all, Cortina thrives in spaces where creativity and community are present. Cortina also serves various folk as a freelancer in roles as facilitator, consultant,motivational speaker, trainer and writer. Since 2007, Cortina has designed trainings, workshops, programs, and events centered on authenticity, community building, creativity, entrepreneurship, innovation, and leadership across the Southeast. In that time, Cortina has worked alongside nonprofits, entrepreneurs, educators, community leaders, artists, festival producers, conference organizers, small businesses and activists alike. Cortina holds a Master of Arts in Management & Leadership; a Bachelors of Science in Business, Education & Social Science; and is a Certified Creative Facilitator through PYE Global (Partners for Youth Empowerment). Throughout her career, Cortina has received recognition as the WNC Minority Enterprise Development’s Emerging Entrepreneur of the Year (2012); 40 Under Forty: Asheville (2013); and inductee to Leadership Asheville (2014). Cortina has served on numerous Boards and Advisory committees, including MLK Jr. Association of Asheville & Buncombe County; YMCA 21st Century Horizons Program; Asheville Area Arts Council; Bele Chere; and Salvation Army Boys & Girls Club. Ultimately, Cortina’s work is fueled by her personal mission – to shift community, business and organizational culture through authenticity, creativity, entrepreneurship, equity, and collective leadership.